Pioneered over 35 years ago, this adventurous 10 day trip visits Egypt's most famous sites, including the Pyramids at Giza; the oldest of the Seven Wonders of the Ancient World. An overnight train journey will be followed by sightseeing in Aswan before spending time sailing along the lifeline of the country; The Nile River. Travelling upriver in traditional, lateen-rigged feluccas, the experience will be a chance to unwind whilst watching the daily life that occurs on the river banks and to escape from normality by sleeping out on deck under a starlit sky. Arrive in Cairo and check-in at our hotel. As flights will be arriving throughout the day, the official welcome meeting will take place on the morning of day two but your local guide will be around to greet you and help with any queries this evening. As one of the largest cities on the African continent, there is plenty to explore if you arrive earlier in the day. Find a seat at one of the riverside cafes alongside the locals and sip on a strong Egyptian coffee while watching the hubbub of life going on along the water, or perhaps find a hole-in-the-wall eatery that serves traditional hawawshi - Arabic bread stuffed with mince meat and spices . Alternatively, take some time to relax before the trip kicks off in full tomorrow. After breakfast and our welcome meeting, we will kick off a very busy day visiting some of Egypt's most famous sites. This morning we will depart Cairo on a short drive to Giza, where we will spend three hours exploring the Pyramids and Sphinx complex; home to one of the Seven Ancient Wonders of the World. A local guide will talk us through the ancient and recent history of this world-famous site, followed by some free time to wander around the complex. Later this morning we make a brief visit to the papyrus institute, where we will be guided through the detailed process of ancient paper making, before taking a break for a well-deserved lunch. This afternoon we return to Cairo to visit the Egyptian Museum, displays over 100,000 Egyptian artefacts, including the mask of Tutankhamun. The collection began in 1835 when the ruler of that period, Muhammad Ali, banned all export of antiquities upon realisation of their cultural (and monetary!) value. The museum will bring Egypt's ancient history to life and will offer a great introduction ahead of our journey. This evening we'll make our way to Giza railway station to catch the overnight train to Aswan. We'll be travelling in sleeper cabins made up with two single beds in a bunk-bed style and a small hand basin. Bedding is supplied and dinner will be served on the train. There are two communal toilets in each carriage. We arrive into Aswan around 8am and have plenty of time to explore. Once the gateway to Nubia and the last frontier of Ancient Egypt, Aswan is sited on the First Cataract of the Nile and offers a noticeable change in pace from Cairo. Here the river shallows and runs lazily northbound past palm trees, meandering around large boulders and small islands. On the East Bank the urban area of Aswan is bustling much like any other Egyptian city albeit a little more low-key, while on the West Bank traditional, Nubian village life carries on as the boats sail past. A 30 minute walk along the river from our hotel, The Nubian museum is worth a visit to learn more about the colourful culture that is believed to have stemmed from one of the first civilisations on the African continent or take a relaxed wander along the Nile to watch life playing out on the water and fishing boats. This afternoon there will be an option to join a trip to visit the High Dam, Philae Temple, also known as the Temple of Isis, and the Unfinished Obelisk. The High Dam is a controversial piece of engineering created to prevent high and low flooding along the Nile, but sadly it's construction led to many archaeological sites being lost under the waters of Lake Nasser. The Temple of Isis on Philae island was one of the sites saved during the flooding, and now stands proudly on the small neighbouring island of Agilkia after being broken down into 50,000 pieces and reassembled. The Ancient Egyptians are world-renowned for being advanced when it comes ancient architecture and a giant example of this is the ancient stone Unfinished Obelisk. Today will be free to continue exploring of Aswan or to visit Abu Simbel. Situated a short walk from our hotel, a visit to Aswan's old souk, known locally as Sharia el Souq, is recommended. Be a part of the busy, daily goings-on in the colourful market place where everything from spices to cotton and perfumes to colourful Nubian baskets are sold. Be prepared to bargain and for a more authentic market experience visit later in the afternoon or early evening when the locals tend to shop. Alternatively, today you may choose to visit Temples of Abu Simbel. Sitting near the border with Sudan, there will be an option to join a coach excursion or take a short internal flight to the small Nubian Town of Abu Simbel, home to two of Egypt's most famous archaeological sites; Ramesses II and The Small Temple of Nefertari. These giant structures were carved into the limestone cliffs at the instruction of the Egyptian King Ramesses II himself to mark his alleged win at the Battle of Kadesh. Hidden in the sand for hundreds of years, it is said that Abu Simbel is the name of a young Nubian boy that led European explorers to the temples in the early 1800s, where they had stood for 3,000 years before being famously moved to make way for Lake Nasser and the High Dam in the 1960s. Early this morning there will be an option to ride a camel through the desert to St Simeon's Monastery for a guided tour. This 7th century monastery was said to be home to over 1,000 monks, who travelled from here into Nubia to convert the inhabitants to Christianity. Fortress-like in its style, the structure is a mix of stone and mud-brick and is said to have been built around a pillar which St Simeon once stood upon to hear divine instructions and advice from above. The monastery was later abandoned due to lack of drinking water and repeated raids by Muslim tribes. Later this morning we will board our home for the next three nights; a traditional felucca sailing boat. We will spend the afternoon sailing down the Nile and it will be a chance to absorb just how important this river is to the Egyptians. After sunset, we'll enjoy a barbecue with the crew before our first night sleeping under the stars. This felucca experience is a simple one but will reward us with a chance to travel towards Luxor as many Egyptians have before, as well as the perfect opportunity to see the more rural side of Egypt, listening to children singing along the riverbank by sunset and falling asleep to the gentle rock of the river. Depending on the group size we will have one or two feluccas manned by the local crew and captain. There will be shaded areas on the deck to escape the midday sun and at night everyone will sleep out on the deck in sleeping bags (bring your own or you can arrange to hire one at the time of booking this trip). During the daytime the boat will moor regularly giving the chance to find a private spot for comfort breaks, while each evening the felucca will be moored for the night and a camp toilet will be built by the crew for a little more privacy. Our crew will make three meals a day; breakfast, a picnic lunch, and often a barbecue of meat or fish in the evenings. These are just examples of the style of food and dietary issues can be catered for with advance notice. Complimentary tea and coffee will be available throughout the time on the felucca and all other drinks will be paid for on-board using a honesty bar system. Luggage will be stored in the bottom of the boat and will be accessible twice per day, so we recommend having a day pack where you can store the things you need during the day. The next few days are subject to change in timings and running order because our pace will be decided by weather conditions and the river's current. Wake up to the sun rising over the river this morning and enjoy a breakfast prepared by the crew. Breakfast will often be a section of eggs, jam, honey, cheese and bread with a side of fava beans for an Egyptian twist. Today we will set sail to Kom Ombo Temple, unusual because of its double design, this once symmetrical temple was dedicated to two different Gods. One of these Gods was Sobek, the 'crocodile God', which explains why 300 mummified crocodiles were found at the site, some of which can still be seen. Since being constructed over 2,000 years ago the temple has been impacted by floods, earthquakes and materials being stolen but the ruins still exhibit great craftsmanship. Most recently, in September 2018 a sandstone sphinx was discovered and the search continues. The rest of the day will be spent on the felucca, with occasional stops to visit small riverside communities or for a swim to cool off. Each day, timings will be flexible depending on the current of the river, so your local guide will give regular information. Today will be truly relaxing. A full free day on the felucca as we continue north towards Luxor, only broken up by stops at small villages or to have a dip in the Nile. From the felucca we will be able to see how much of life in Egypt hasn't changed for thousands of years and timeless traditions carry on untouched by tourism and the modern western culture we are attuned to. Donkeys and goats walk along the banks, children wave excitedly, and elder generations sit in the shade wearing traditional gallibiyahs and head scarfs to protect themselves from the warm sunshine. A slow start this morning to make the most of our final few hours on the Nile before we moor to meet our vehicle to head into Luxor. Built upon the ruins of the once powerful Greek city of Thebes, there is evidence of Luxor's rich past whichever way you turn. Like Aswan, Luxor is a city of two halves split by the river. The east side is more urbanised with a great selection of shops and restaurants including well-recognised western brands, while the west is quieter with fewer restaurants serving more tradition fare. During our time in the city we will be staying on the more tranquil West Bank in a small, family-run hotel and crossing the Nile to the busier East Bank is easy, cheap and possible at all times of the day and night. Our hotel offer transfers across the river free of charge at set times. This afternoon we'll make our way by traditional horse-drawn carriages, known locally as a calesh, to the Karnak Temple Complex. 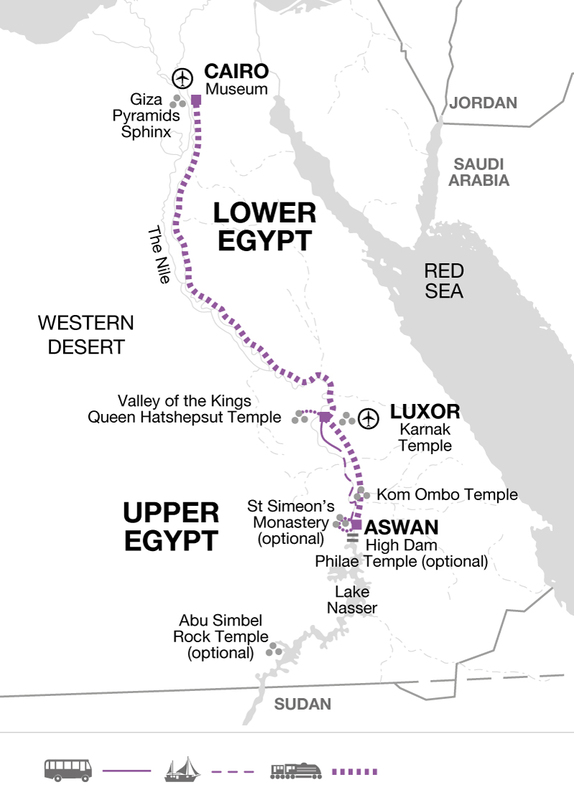 Once there we will spend over two hours exploring what was once Egypt's most important place of worship and depending on which research you read dates back somewhere between 1,500 - 4,000 years depending. The complex is made up of temples, the most important being The Temple of Amun Ra, houses of royalty and large sphinx lined avenues, and although many of the structures are in varying levels of ruin it only takes a while of wandering around to imagine the bustling community it once was. It is believed that during its peak there were some 80,000 servants working here, pillars were brightly and ornately painted and lush gardens covered much of the grounds. Arguably Egypt's most well known site, this morning we will visit the Temple of Hatshepsut and the Valley of the Kings. Pharaoh Hatshepsut is believed to be the most successful reigning female power of Egypt, no mean feat during Ancient Egyptian times, and was buried alongside her male counterparts in the Valley of the Kings. Historians throughout modern history offer contrasting information about her reign but walking into the shadow of Hatshepsut's immense temple, which is built into the limestone rock face on Luxor's West Bank, is a key symbol of her achievements. The structure has been carved into the rocks under rugged cliffs and is unexpectedly modern by design, it was once linked directly with Karnak Temple on the East Bank and was approached by a 30 metre wide avenue. We will later transfer to the world-famous Valley of the Kings, most well known as the burial site of Tutankhamun discovered in 1922 by British Egyptology Howard Carter, along with another 62 royal tombs. Our visit includes entrance to three of the tombs which will be decided on the day, as many are periodically closed for resting and renovation to protect them. After the three, there will be an option to pay a supplement to visit Tutankhamun's. Returning to our hotel the rest of the afternoon will be free to continue exploring. The West Bank offers a relaxed atmosphere, and visitors will often find themselves wandering down the dirt roads with few cars and past herds of goats grazing on the water's edge. Alternatively, make use of the hotel pool or rooftop bar with views across to the East Bank before our final group meal. The trip ends in our Luxor hotel after breakfast. Egypt has two seasons, a mild summer and a hot summer, so light, comfortable clothing is recommended for sightseeing and exploring the cities. However, the nights and early mornings can get cold, so we'd suggest layering up and packing a jumper and/or scarf. Don't forget swimwear if planning to use any hotel pools or to cool off in the Nile. Please note, women are advised not to wear shorts or dresses that are too revealing as this can attract unwelcome attention in the streets of Muslim towns - loose fitting trousers or slacks are ideal. Women should also cover their head and shoulders when entering a mosque and men should wear long trousers. This trip makes use of simple accommodation throughout. Our hotels in Cairo and Aswan are both centrally located in the busier urban areas and shops, restaurants and some attractions are easily accessible on foot. While in Luxor we will be staying on the quieter side of the river in a small family-run hotel, with a pool and a rooftop restaurant with views over the Nile, to make the most of the nearby location to the historic sites. On the overnight train between Cairo and Aswan we use sleeper compartments, each containing a bench seat which converts into bunk beds. The carriage steward sets this up and provides bed linen, blankets and pillows. Each cabin is lockable and has a night light and a small sink, shelf, mirror, towel and power socket plus there is a removable table top that folds into the wall. Dinner and breakfast is delivered directly to you. Two western style toilets are located at the end of each carriage and there is a communal lounge carriage with a bar serving soft drinks. During our three nights on the Nile, depending on the group size we will have one or two feluccas manned by the local crew and captain. Sleeping arrangements are simple, sleeping on mattresses out on the deck of the boat with sleeping bags. Sleeping bags can be rented for £10 per person per night and to book this you must notify Explore at least 14 days prior to travel, otherwise we're unable to guarantee there will be a sleeping bag available. During the daytime the boat will moor regularly giving the chance to find a private spot for comfort breaks, while each evening the felucca will be moored for the night and a camp toilet will be built by the crew for a little more privacy. On the felucca, there will be three meals prepared per day. As an example, breakfast will be of eggs, bread and preservatives, lunch will be a picnic often including tuna or cheese with salad and bread, and evenings meals will be a barbecue of meat or fish in the evenings. Dietary issues can be catered for with advance notice. Complimentary tea and coffee will be available throughout the time on the felucca and all other drinks will be paid for on-board using a honesty bar system. As well as a chance to see Egypt's world-famous highlights, the three night felucca sailing is an opportunity to experience the other Egypt: the quieter, more traditional and natural side. Be rocked to sleep by the river and woken by the sunrise, and spend the time between reading and relaxing. Days spent on the river is time to slow down, unwind and to see the Egyptian's day-to-day life along the heart of the country; the Nile.